– Arrival and Transfer to hotel for check in. Novotel hotel, Novotel Saigon Centre, 167 Hai Ba Trung, District 3, Ho Chi Minh City. We enjoyed a welcome function to meet our travelling companions. 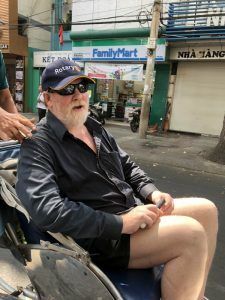 Stayed overnight in Ho Chi Minh City. After breakfast we drove to Tao Dan Park to visit the Saigon Bird Club and entertained by the lively chirping songbirds while sipping a cup of Vietnamese hot coffee. One of the city’s most attractive green spaces is 10-hectare Tao Dan Park, its bench-lined walks shaded with avenues of towering tropical trees, including flame trees and vast Sao Den and So Khi trees. It’s fascinating to visit in the early morning and late afternoon when thousands of locals exercise. Also noteworthy is the daily flocking here of the city’s bird lovers (mainly elderly gentlemen), who arrive, cages in hand, at what is universally known as the bird cafe. We took a cyclo ride to China Town to experience the smells of traditional herbal medicines & incense. 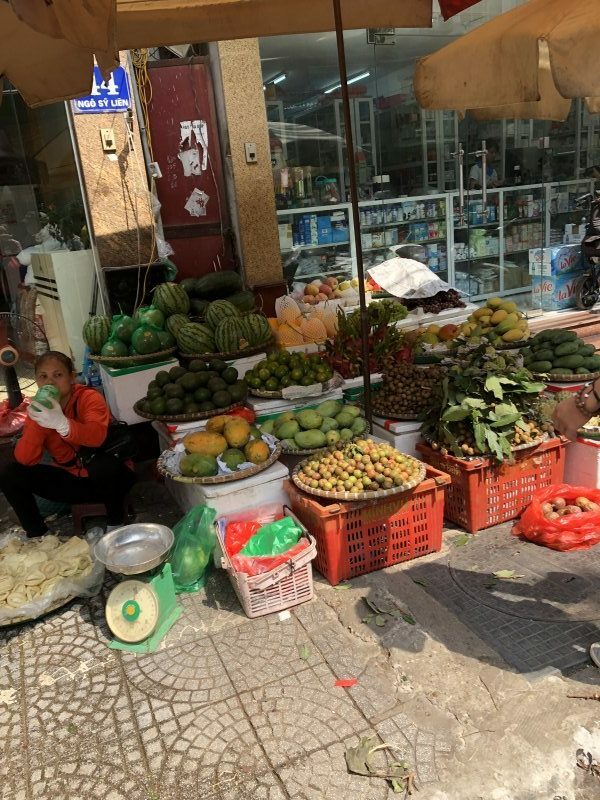 Cholon, which directly translates to “Big Market”, was first established in the late 1700’s when a large number of Hoa, an ethnic Chinese minority residing in Vietnam, were forced from the nearby city of Bien Hoa. Over the next hundred years, the area continued to grow in size and population until it was eventually incorporated in 1879. Within 50 years, this hectic Chinese marketplace would join with the city it directly bordered and become Saigon-Cholon. Although the moniker was officially dropped in the 1950’s, Cholon’s charm is still very much alive, having spread to encapsulate parts of District 5, 6 and 11 today. Then a drive back to Ben Thanh Market to enjoy authentic Pho noodle soup at Pho 2000, which had the honour of receiving the former U.S. President Bill Clinton. We visited the War Remnants Museum. 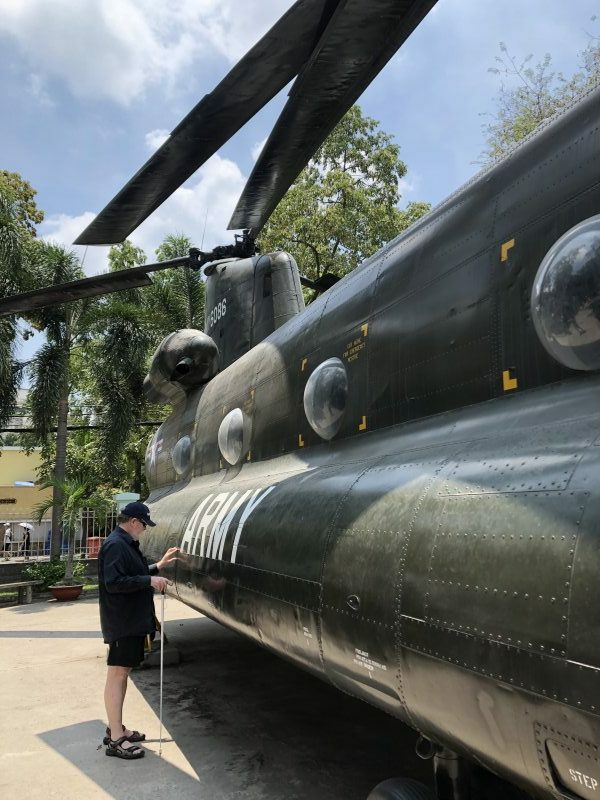 The War Remnants Museum is a war museum at 28 Vo Van Tan, in District 3, Ho Chi Minh City (Saigon). It contains exhibits relating to the Vietnam War and the first Indochina War involving the French colonialists. then on to visit a family of local musicians and enjoyed their performances. 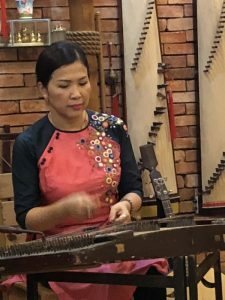 They introduced us to Vietnamese traditional instruments and allowed us to try these which created a great deal of noise and merriment. In the evening, we had dinner at Noir Restaurant ‘Dining in the Dark’ designed to take you on a journey of the senses. Stayed overnight in Ho Chi Minh City. We were picked up from our hotel and transfered to the wholesale Flower Market. Starting our foodie tour with one of the most famous Vietnamese snacks – “Banh Mi”; a crunchy fresh French roll mixed with the taste of sour pickle, pate, cold cuts, soya sauce, chili… While walking through the market alleys to experience the bustling local life, we had a chance to try the local seafood noodle soup, taste some fried banana, fresh spring rolls, Choose dessert from various kinds of “Che” – sweet soup in Vietnamese – cooked by different ingredients: dry fruits, beans, jelly, coconut milk, nuts… we Walked through the flower shops and relaxed by a local café. Then we drove to Mr. Duc Dau’s house, the master of instrumental percussion. We Visited students in Nguyen Dinh Chieu Vision Impaired School. Transferd to airport for flight to Da Nang. Upon arrival, transferd to Hoi An for check in at our hotel. Royal Riverside Hotel, 40 Nguyen Du, Hoi An Town, Quang Nam Province. Stayed overnight in Hoi An. We started our day visiting Hoi An fish market, experienced the sounds & smells of the busy local market place. We then drove to visit one of Hoi An’s famous lantern workshops, where we learnt how to make one. We then went to a local restaurant to enjoy Cao Lau as well as Mi Quang, typical and symbolic foods of Hoi An Ancient Town. We then had a meal with a farmer’s family in Tra Que village before returning to our hotel. 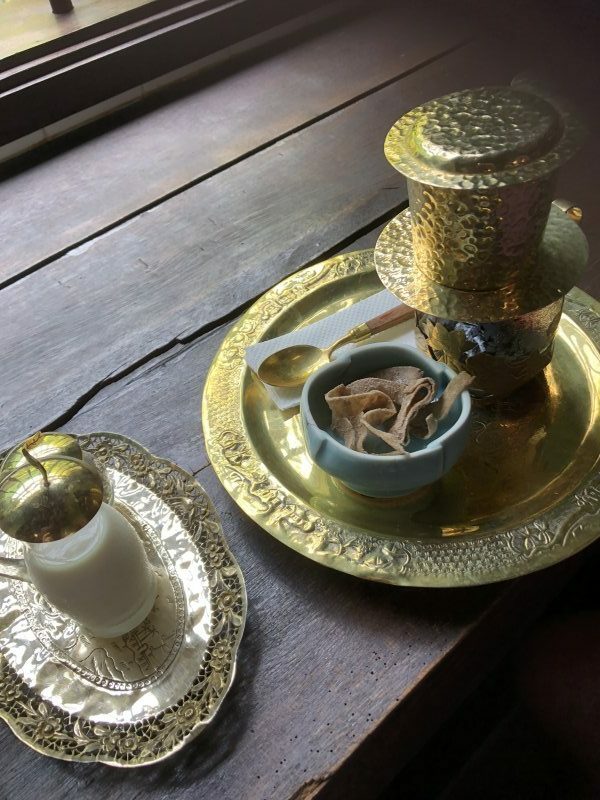 Stayed overnight in Hoi An. Everywhere in Vietnam we saw rice paddies. Rice is a part of life and it reflects the Vietnamese culture. We were met at our hotel and transferred to a village for a short journey on a buffalo cart to a farming family. We Met the farmers and enjoyed rice tea. 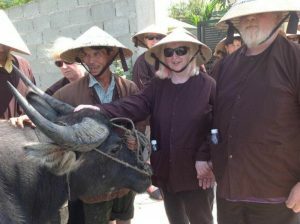 Putting on traditional Vietnamese farmer clothing we prepared for an experience in the field. 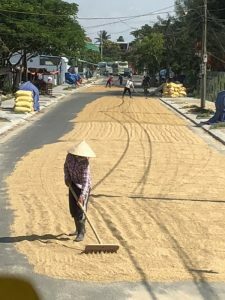 We were told about the life of the countryside people as well as the traditional ways of producing rice: raking soil, transplanting rice and preparing cooking rice. 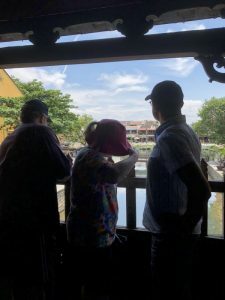 In the afternoon we took a walking tour in and around Hoi An town. That evening, we had dinner at a local restaurant which offerd local folk music whilst you dine. Stayed overnight in Hoi An. Transferd to Da Nang airport for our flight to Hanoi. The traffic in Hanoi is quite a thing. Take a group of aussies who are blind and try crossing a road. 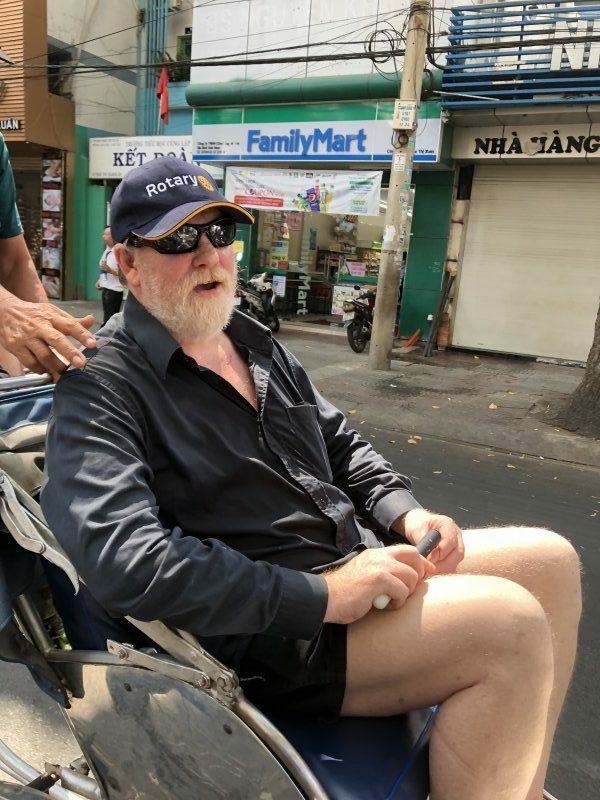 The Vietnamese are very accommodating though, the traffic just parts as you walk out onto the road. In the afternoon we went on a 3 hour Hanoi Foodie Tour. 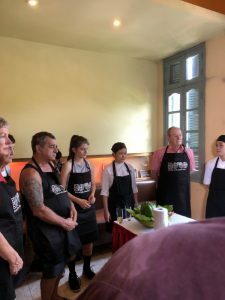 We discovered many ways Vietnamese food is cooked & prepared as well as how to taste it properly. Stayed overnight in Hanoi. In the morning, we drove to Bac Ninh, an area considered the cradle of traditional Vietnamese music and theatre. Visiting the Do Temple where Kings of the Ly Dynasty are worshiped. Located in the Red River Delata Vietnam, Bac Ninh Province is attracting the most high-tech enterprises in Vietnam. In addition, this is the place where the cultural identity of Kinh Bac region is reserved, especially Quan Ho singing. Bac Ninh, the smallest province in Red River Delta Vietnam, is located in the Northern key economic region. 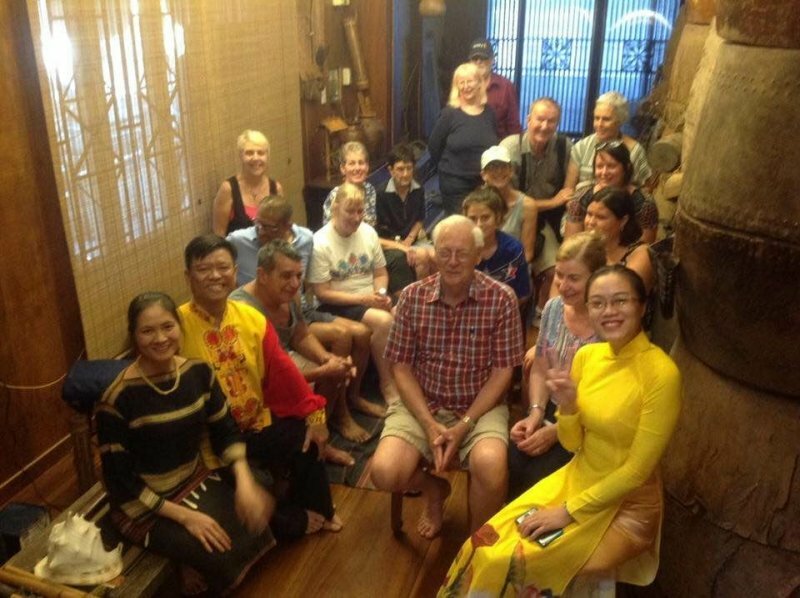 We then went to Dinh Bang communal house, Listening to the UNESCO recognized Quan Ho folksongs. We had lunch at Dinh Bang communal house before returning to Hanoi. We visited the water puppetry making place of Mr Phan Thanh Liem where we learnt how a water puppet is made and controlled. Water puppetry “Making puppets dance on water” is a tradition that dates back as far as the 11th century when it originated in the villages of the Red River Delta area of northern Vietnam. Today’s Vietnamese water puppetry is a unique variation on the ancient Asian puppet tradition. The puppets are made out of wood and then lacquered. The shows are performed in a waist-deep pool. A large bamboo rod supports the puppet under the water and is used by the puppeteers, who are normally hidden behind a screen, to control them. Thus the puppets appear to be moving over the water. When the rice fields would flood, the villagers would entertain each other using this form of puppet play. Back to the hotel. Stayed overnight in Hanoi. We visited the Koto Cooking class and had lunch at Koto Restaurant. KOTO, located close to Van Mieu – the first University in Vietnam and managed by Jimmy Pham with Vietnamese and foreign professional cooks. 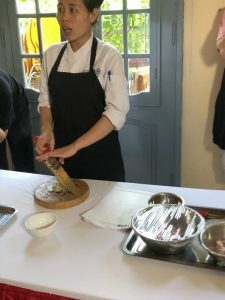 It not only boasts a traditional restaurant but also Vietnamese traditional cooking classes. This tour offers Vietnamese cooking classes for tourists who are interested in cooking. The teachers bring their excellent skills to you in a fun environment. In the afternoon, we drove to Bat Trang Village, renowned for its ceramics. On arrival, took a stroll through narrow lanes of the ancient village to discover and witness the art of pottery and ceramics coming to life. Under the guidance of skilled artisans, we learnt how to shape ceramic products. Bát Tràng is an old, well established village in the Gia Lâm district of Hanoi, the capital city of Vietnam. It is about 13 km from central Hanoi. It is famous for producing a unique style of ceramics called Bát Tràng Porcelain. Bát Tràng is well known throughout Vietnam for its beautiful ceramics. We then visited Hanoi Training and Rehabilitation Centre for the Blind (TRCB). In Hanoi the Training and Rehabilitation Centre for the Blind (TRCB) offers courses in Therapeutic Massage, Computer Proficiency, English, Business Management and Communication Skills to blind students from the many provinces of Vietnam, thus greatly improving their employment opportunities and capacity to live productive and independent lives. While at the Training and Rehabilitation Centre we were entertained by twins who are blind with some great singing. Then back to the hotel. Stayed overnight in Hanoi. We had free time until transferring to the airport for our departure flight.